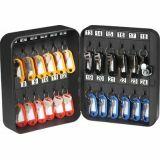 This Honeywell Model 6105 Steel 24 Key Security Box features 24 key hooks with 24 key rings and tags included, scratch resistant powder coat finish and pre-drilled holes and mounting kit included. Backed by a 1 year limited warranty. 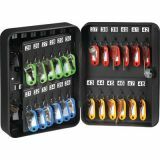 This Honeywell Model 6106 Steel 48 Key Security Box features 48 key hooks with 48 key rings and tags included, key lock that includes 2 keys, scratch resistant powder coat finish and pre-drilled holes and mounting kit included. Backed by a 1 year limited warranty. The Honeywell 6505 Key Locking Zipper Deposit Bag is a great way to keep small objects secure when on the go. 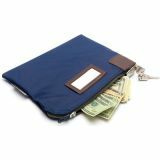 This blue zipper bag includes a key lock with 2 entry keys, a plastic ID card window located on the front, and a cardstock ID card for labeling purposes. The Honeywell 6505 is backed by a 1 year limited warranty. 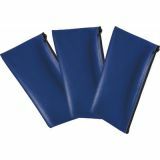 The Honeywell 6503 Multipurpose Zipper Bag 3 Pack is a great way to keep small objects secure when on the go. Keep your belongings organized in these three sturdy zipping polyester bags. The Honeywell 6503 is backed by a 1 year limited warranty. 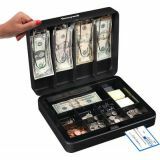 The Honeywell Model 6113 Deluxe Cash Box includes a removable cash tray and fits 4 currency clips in lid, check deposit slot on front, 1 bill and 8 coin slots. It features a scratch-resistant powder coat finish, additional storage under tray and a convenient carry handle. Backed by a 1 year limited warranty. 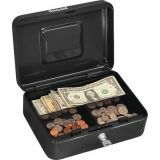 The Honeywell Model 6202 Small Steel Cash Box features a removable tray with 2 coin and one bill slot, under the tray is an additional compartment for extra storage. The 6202 includes a key lock with 2 entry keys, a scratch-resistant powder coat finish, pre-drilled mounting holes and hardware, and a convenient carry handle. This Steel Cash Box is ideal for locking up cash and other small valuables. The Honeywell Model 6202 is backed by a 1 year limited warranty.